The mother is everything in life. distress, the strength in our weakness. She is the source of compassion, she is love and grace. his head, a hand that blesses him, a gaze that protects him. 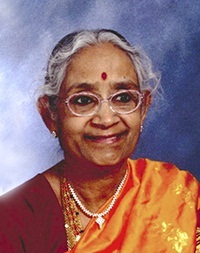 Durvasula Bala Tripura Sundari, 79, passed away peacefully at 2:25 am January 10, 2016 in Chandler, AZ, USA. Sundari “Sue”, although fighting a long battle with her illness, never once gave up her spirit & love of life. Through trials and tribulations of life, our mother continued to be a pillar of strength for the family. Born in Rajahmundry, India she migrated to the USA with her late husband and 3 children in 1967. Although settling her life in the USA, she never gave up her traditions and culture . . . her roots. She was a loving wife and a mother to her 3 children Somayajulu (Sam), Lakshmi and Radhika, who will continue her legacy and traditions. She is also survived by her son-in-law, Nagendra Prasad Palakodaty; daughter-in-law, Indu Durvasula; and grandchildren: Sri Rama Durvasula, Janardan Durvasula, Shivani Palakodaty and Srikari Palakodaty. The family would like to express their sincere gratitude to everyone touching our mother’s life. We thank God for the gift of her life and the blessing of time spent with our mother. A Memorial / Visitation service, celebration of life, will take place honoring Durvasula B. Sundari on Saturday, January 16, 2016 at 8:00 AM at Bunker’s University Chapel, 3529 E. University Dr, Mesa, Arizona, USA 85213. Hindu Priest Kameswara Sarma will officiate. Cremation will be at Bunker’s East Valley Crematory. Love, thoughts, prayers go out to all who’s heart she touched – she touched mine & is sadly missed! My most deepest and sincere condolences for the passing of your Mother. You and the rest of your family are on my family’s prayers and thoughts. I am saddened to hear about the demise of your beloved mother. There are no words to express my concern for this great loss to you and all other members of your family. Though I was never privileged to meet her, I believed you when you said your mother was a kind lady, helpful to others and possessed of great qualities of head and heart. You have to bear this loss with patience and courage. Time will surely heal your wounds in due course. My condolences to the family. May her memory be eternal. Dear Sam, Indu, Radhika & all family members, Our thoughts and prayers are with you at this time. Mom was awesome and a happy sole. She touched many hearts with her charisma, love, enthusiasm and sharp memory. She will be missed by many but her memories will be always cherished. with Love. May your mother’s loving memories forever be in your heart and may the love of those around you help you through the days ahead. My thoughts and prayers to you and the family during this difficult time. My deepest condolences. Her legacy will live on through her children and grandchildren for many generations to come. I will keep all of you in my thoughts and prayers. Indu: please accept my condolences for you and your family. My thoughts and prayers are with you. So sorry to hear of your loss. Much love your way as you celebrate and remember your mother/mother-in-law. Dear Sam, Indu and entire family- my heartfelt sympathies to all of you during this difficult time. I know you have such fond memories of your mom (mother-in-law) that will be with you forever. So glad you were able to spend Thanksgiving with her this past year. I am thinking of you during this difficult time. Enjoy the celebration of Sue’s life with your family. Sending many hugs. Lucky, Sash, Dinesh & Manoj. Heartfelt condolences to Sam, Lakshmi and Radhika. May God grant you the fortitude to bear the loss and May the departed soul rest in peace. Indu- I’m saddened to hear about you and your family’s loss. I know how much you cared about her. I will keep your family in my thoughts and prayers. We are so sorry for your loss. Your Mother was an amazing woman, and we have such warm memories of her grace and kindness. With Love and Condolences, Siva, Jayne, Dimitrios, and Nicko. We are so sorry for your loss . We will be praying for your family. May she rest in peace.